For other uses, see Dawei (disambiguation). Dawei (Burmese: ထားဝယ်မြို့; MLCTS: hta: wai mrui., pronounced: [dəwɛ̀ mjo̰]; Mon: ဓဝဲါ, [həwài]; Thai: ทวาย, RTGS: Thawai, pronounced [tʰā.wāːj]; formerly known as Tavoy), is a city in south-eastern Myanmar and capital of Tanintharyi Region, formerly Tenasserim Division, about 614.3 km (381.7 mi) south of Yangon on the north bank of the Dawei River. Population (2004 estimate), 139,900. It is at 14.09°N 98.20°E. Dawei is a port at the head of the Dawei River estuary, 30 km (18.6 mi). from the Andaman Sea. As a result, the city is prone to flooding during the monsoon season. "Dawei" is also the name of one of Myanmar's 135 ethnic minorities. The area around the Dawei River estuary has been inhabited for centuries by Dawei, Mon, Kayin, and Thai mariners. From the 11th to 13th centuries, Dawei was part of the Pagan Empire. From 1287 to 1564, Dawei became part of the Sukhothai Kingdom and its successor Ayutthaya Kingdom (Siam). From 1564 to 1594, Dawei was part of the Toungoo Kingdom of Burma. Siam temporarily regained the city between 1594 and 1614. 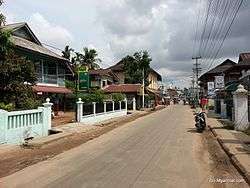 From 1614 to the 1740s, Dawei was the southernmost city under Burmese authority, and was defended by a Burmese garrison. In the late 1740s during the Burmese civil war of 1740–1757, Dawei, along with the northern Tenasserim coast, was taken over by Siam. Burma regained the city in 1760, and extended its control over the entire Tenasserim coast in 1765. The Tenasserim coast was ceded to the British after the First Anglo-Burmese War (1824–1826). After independence in 1948, the city became part of the Tenasserim Division, which also included today's Mon State. In 1974, Mon State was carved out of Tenasserim and Dawei became the capital of the truncated Division. In 1989, the city's English name was changed from Tavoy to Dawei, and Tenasserim became Tanintharyi. Dawei features an extreme tropical monsoon climate (Köppen climate classification Am), similar to Sittwe further north-west. There is a substantial dry season from November to April, but in the wet season the influence of local mountains causes Dawei to receive as much as 1,300 millimetres (51 in) precipitation per month. Apart from the Chocó region of Colombia, and the area around Mount Cameroon in Africa, it is possibly the wettest lowland tropical region in the world. Only recently was Dawei connected to the rest of Myanmar by road and rail. There are plans to construct a deep water port in Dawei. In November 2010, the Myanmar Port Authority signed a US$8.6 billion deal with Italian-Thai Development to develop the seaport at Dawei. 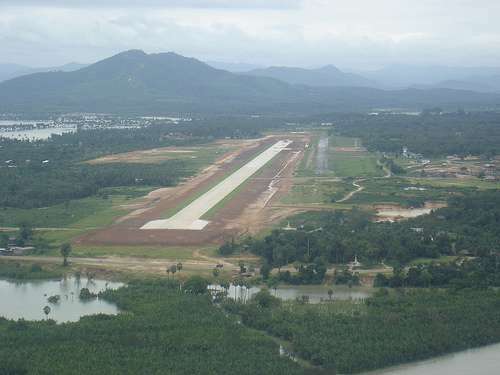 The Dawei Special Economic Zone would become Myanmar's first special economic zone (SEZ), which includes plans to develop a 250 square kilometres (97 sq mi) industrial estate, with sea, land (railway and road) infrastructure links to Thailand, Cambodia, and Vietnam, as well as a gas pipeline to Thailand's Kanchanaburi Province and commercial and residential developments. The development of the SEZ has been linked to land confiscations and land grabs from farmers of upwards of 63,768 acres (258.06 km2) (direct) and 153,919 acres (622.89 km2), potentially displacing 500,000 Dawei natives. A transnational highway and a railway line across the Tenasserim Hills connecting Dawei and Bangkok are planned if the deep water port project goes ahead. This port could significantly reduce Singapore-bound traffic when completed. Dawei longyis (sarong) are one of the area's well-known products. The area produces rubber, dried fish, and teakwood. It also produces cashew nuts and betel nuts and exports them through local traders to China, India, and Thailand. Dawei is also well known for its variety of tropical fruits such as pineapples, a variety of mangoes, mangosteens, and durian. There is one fruit called zin thi (in Dawei language), which can only be found in Dawei and surrounding areas; this fruit is sweet with a touch of sour. Dawei is also getting a proposed special economic zone plus deep sea port called the Dawei Port Project. It is undergoing construction with companies providing a road link to Thailand, port construction, and a rail connection. It is partly being developed by Italian and Thai companies. ↑ "Climatological Information for Dawei, Myanmar". Hong Kong Observatory. Retrieved January 12, 2013. ↑ "Railway Gazette: China's horizons extend southwards". 2011-01-06. Retrieved 2011-01-06. ↑ Aye Thidar Kyaw; Stuart Deed (7 February 2011). "SPDC signs Special Economic Zone law into effect on Jan 27". Myanmar Times. Retrieved 23 August 2011. ↑ Thein Linn (4 November 2010). "Dawei deep-sea port, SEZ gets green light". Myanmar Times. Retrieved 23 August 2011. ↑ "Italian-Thai takes lead in delayed Dawei". Investvine.com. 2012-10-30. Retrieved 2013-02-27. ↑ Loewen, Elizabeth (September 2012). "Land Grabbing in Dawei (Myanmar/Burma): a (Inter)national Human Rights Concern" (PDF). Transnational Institute. ↑ "Dawei Traditional Longyi Weaving Art inc. video".